We are the staff of Barranquilla Plaza Hotel，which is located in the most flourishing area of Barranquilla,Colombia. Since its opening, our hotel has been operating well and has a high level of customer satisfaction. But some time ago, we encountered a problem that was even serious enough to affect our normal operations.The wireless network of our hotel has shown significant inefficiency. The network was plagued with persistent issues, such as dropped connections, dead zones and insufficient capacity, while being managed by an outmoded system.Moreover, the installation design of the old APs is not very compatible with the style of our hotel, which also caught our attention. In response to these problems, our leaders put forward some requirements for the hotel's wireless network. They believe that we must let our wireless network cover every corner of the hotel, and also make it easier for administrators to manage the network. At the same time, the visual hardware of the hotel must also complement the hotel's decoration style. In order to achieve the above goals, we have invited CONALCO to do field research and survey for us. After the investigation, they suggested that we use TP-Link products to improve our network. They believe that we could provide seamless wireless coverage for all guest rooms and facilities using 70 TP-Link Auranet EAP115 units and three TL-SG3424P PoE switches, each capable of connecting and powering up to 24 EAPs. 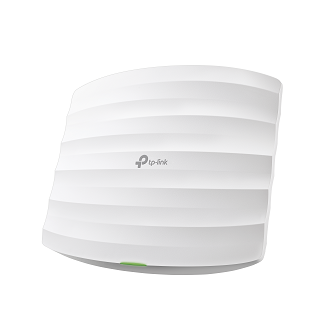 TP-Link's EAP can be easily attached to any wall or ceiling surface, and it is powered by PoE, which makes EAP deployment more flexible and does not require deliberate adaptation to the way the wires are installed.After installation and commissioning, guests and staff throughout the hotel generally reported that they received a strong wireless network and the network was very stable. The staff told us that this is because the EAP120 uses the integrated Qualcomm Atheros 560MHz chipset to ensure high quality hardware. For our hotel managers, the EAP Controller software greatly facilitates our centralized management of the network. Its user interface is very intuitive, so it's easy to operate. Technicians can quickly configure and monitor the network with this software. Moreover, we do not need to pay for this software.Both employees and customers can log in to the network through Captive Portal. Each of them has their own unique identity on the network. Our managers can control their Internet time and Internet bandwidth from the backend of the system.In addition, the appearance of the EAP120 is less noticeable, which allows it to be installed without affecting the aesthetics of the interior design. All of the above, not only provides the hotel with the best cost-effective solution, but also gives customers and employees a good network experience. After these network hardware devices were put into use, our management expressed great satisfaction with the hotel's network status, and more and more of our customers are willing to give us five-star praise on the network. TP-Link's products have revolutionized our hotel's wireless network system. This will be very useful for you and you have to follow to learn more ideas to get control how to add control panel icon on desktop in windows 10 over your windows 10 OS control panel.